The ultimate objective in Dota 2 is to destroy your enemy’s ancient, the massive structure at the heart of their base. Do that and you win. 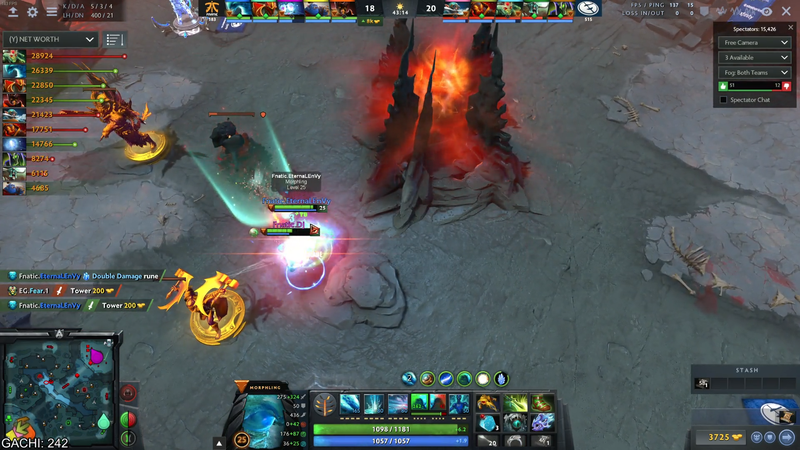 When Evil Geniuses went on a potentially game-ending push into Fnatic’s base today, Jacky “EternalEnvy” Mao of Fnatic responded by going straight for the game-winner. Evil Geniuses were behind but not out. Clinton “Fear” Loomis was on Medusa, and the team knew that one good fight meant a win. Picking up a Divine Rapier, Dota’s ultimate must-win item—it grants massive damage, but drops on the holder’s death for anyone, enemy team included, to pick up—EG ran it down mid looking for the big game-ending fight. While three of Mao’s teammates kept Evil Geniuses busy in Fnatic’s base, Mao and one of his supports, Djardel “DJ” Mampusti, warped right into the enemy base. It was a single game in ESL One Birmingham’s group stage, but the series was a best-of-one, a single match. Mao bet that a 50-50 shot at winning was better than waiting for the carries of Evil Geniuses—heroes like Gyrocopter, Medusa, and Ember Spirit who exponentially spike in power with items—to run them over, and it paid off. It’s rare to ever see this sort of thing happen in modern Dota. There is an actual mechanic in the game called backdoor protection which exists to deter you from sneaking into the opponent’s base without support from your team’s naturally generated army. If none of your team’s uncontrollable minions are nearby, towers gain increased armor and regeneration to prevent heroes from just sneaking in and throwing themselves at towers until they fall—except Mao blew right through backdoor protection and destroyed the ancient anyway. Mao was playing Morphling, a hero that can switch his attribute points from strength to agility or vice-versa. While strength determines a hero’s health and regeneration, agility determines attack speed and is also Morphling’s natural affinity—so it boosts his damage. Dumping all his points into agility gives him incredible attack damage and speed, at the cost of his health. He also picked up a double-damage rune before they warped in, effectively doubling the output he’d normally do. While that might be enough to do some damage, it’s Mampusti’s Io that solves the backdoor problem. Io the wisp is a support character that can link to an allied hero (giving them increased regeneration), overclock them to speed up their attacks, and warp anywhere on the map for a short period of time before returning to its original place. The warp creates the backdoor, and one of Io’s talents makes it usable: once Io reaches a certain level, it can attack its tethered ally’s target at an equal same rate-of-fire. Mampusti had the foresight to pick up a Desolator, an item that causes a hero’s attacks to shred its target’s armor, and the pair created a base-shredding nightmare. Evil Geniuses figured out what was happening but it was too late. Three tombstones and the attempts of two EG players couldn’t stop it, and Mao’s gambit gave Fnatic the win. Io players everywhere rejoiced, before shuddering at the thought of how this might affect the little ball of light in the next patch.